While many of us love nature walks, we don’t all have easy access to hillside trails. 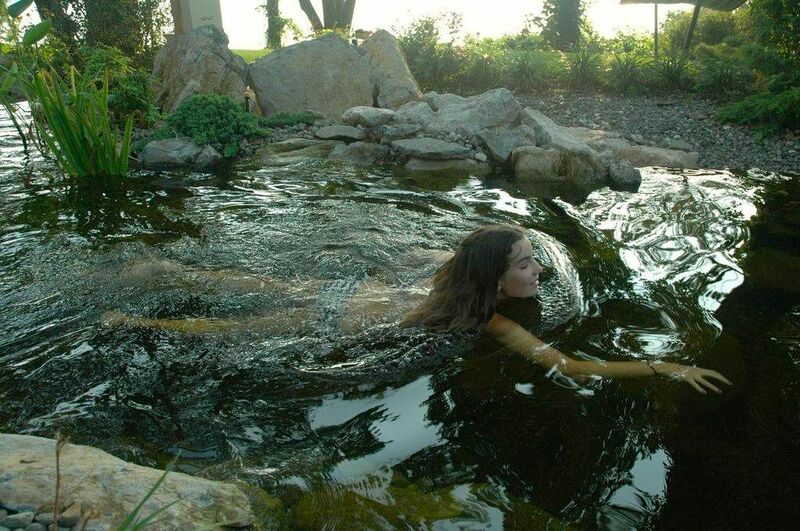 Well, imagine being able to enjoy a nature trek any day you feel like it. 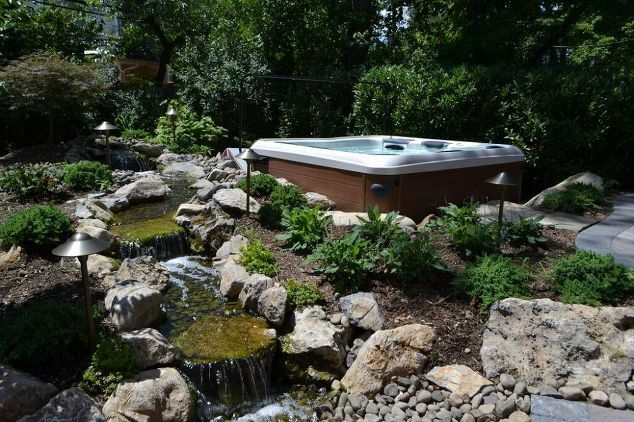 It’s possible, if you’re fortunate enough to have an unused area of sloping yard. That was the case for this award-winning project showcase. Their property had an unused slope near their patio. 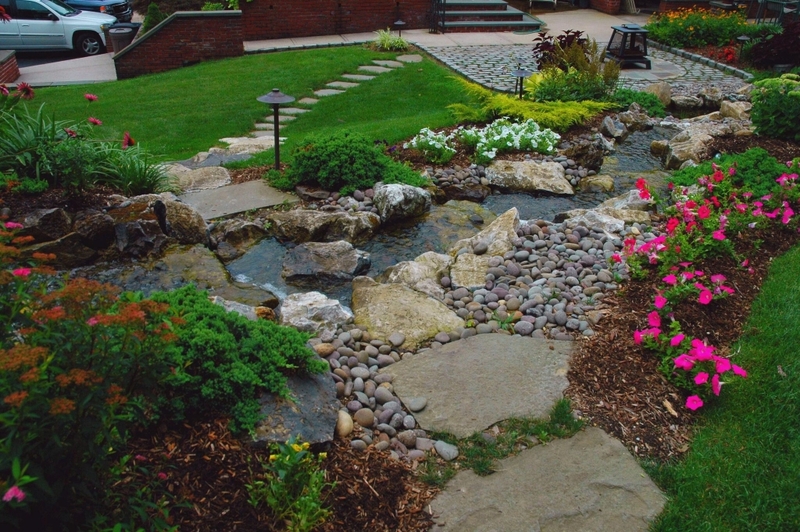 This allowed Deck and Patio to design/build a 35-foot-stream, with two stepping stone paths on either side, that gently moves along the grade solely with the help of Mother Nature’s gravity. We also positioned natural moss rock boulders and plantings, as well as river stones along its banks to make a perfect area for strolling, bird-watching, etc. 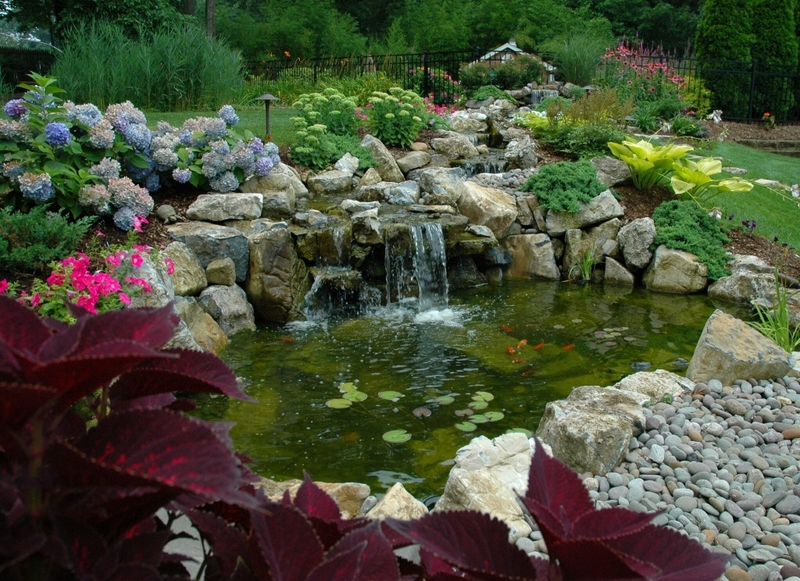 At the end of the stream, the water falls over moss rock into a 10-foot-by-15-foot fish pond. Here, the adjacent landscape is graced with tall grasses (e.g., Miscanthus) and evergreens such as Juniper Parsoni, which provide a lush backdrop to it all. 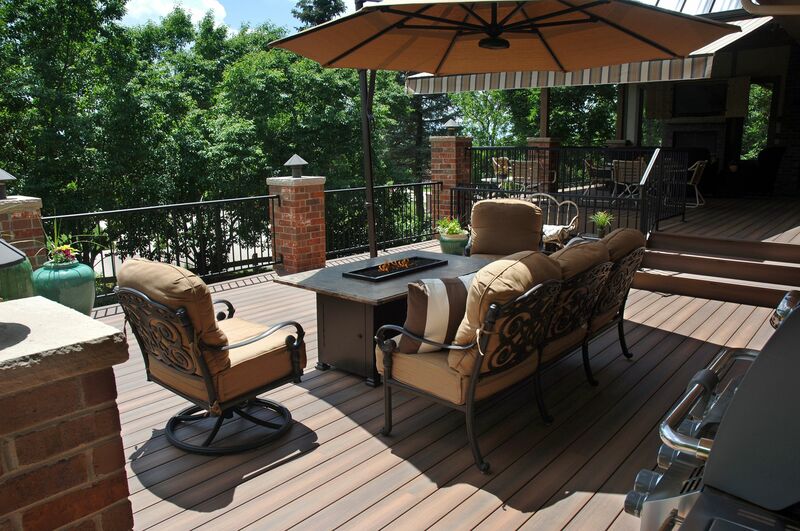 This project earned The Deck and Patio Company a Silver Award from the Northeast Spa and Pool Association (NESPA). 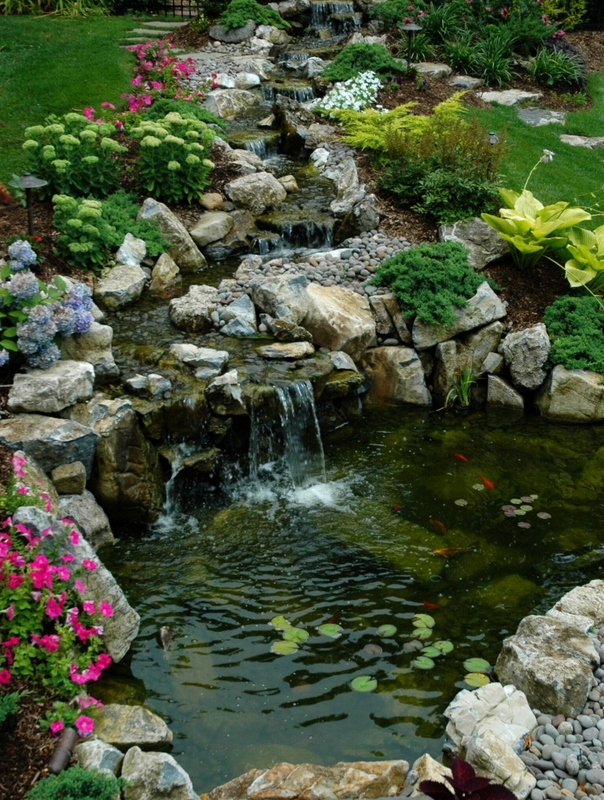 This beautiful watery trail meanders along a formerly unused slope in the clients’ backyard. 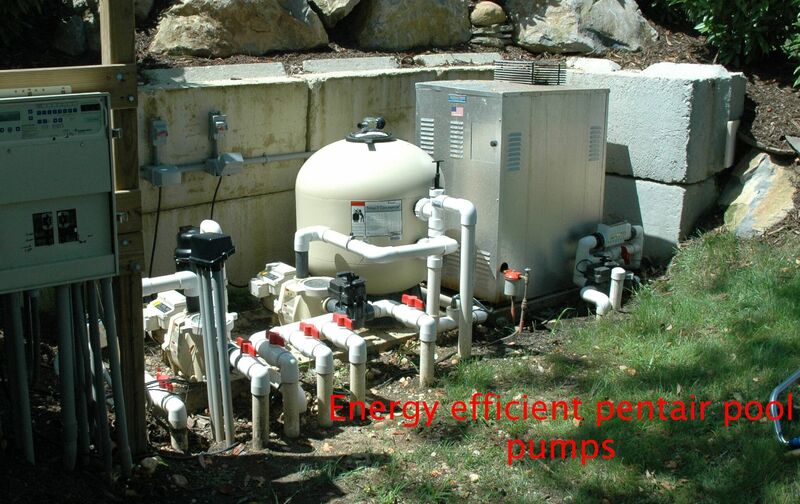 Gravity is a very energy-efficient way to make the water move forward. During winter, the moss rock boulders become stunning ice sculptures that beautifully extend the seasonal enjoyment of it all. 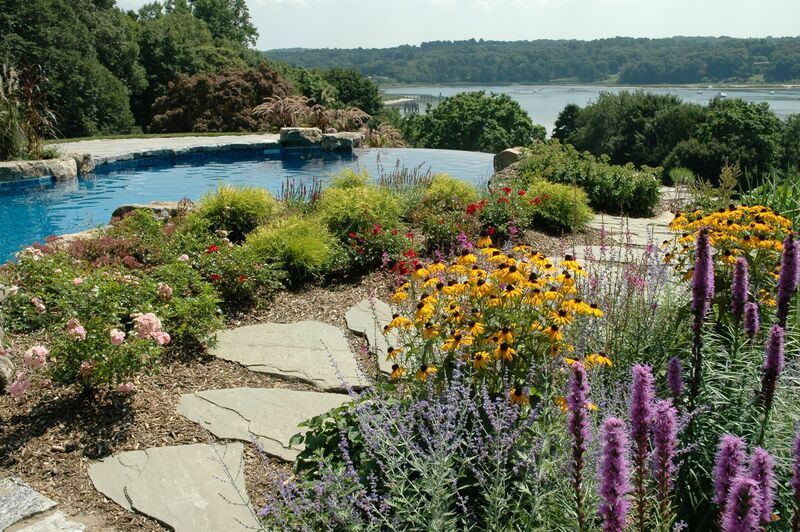 Deck and Patio added such lovely bursts of color as Purple Cone flowers, Coreopsis and Spirea Anthony Waterers. 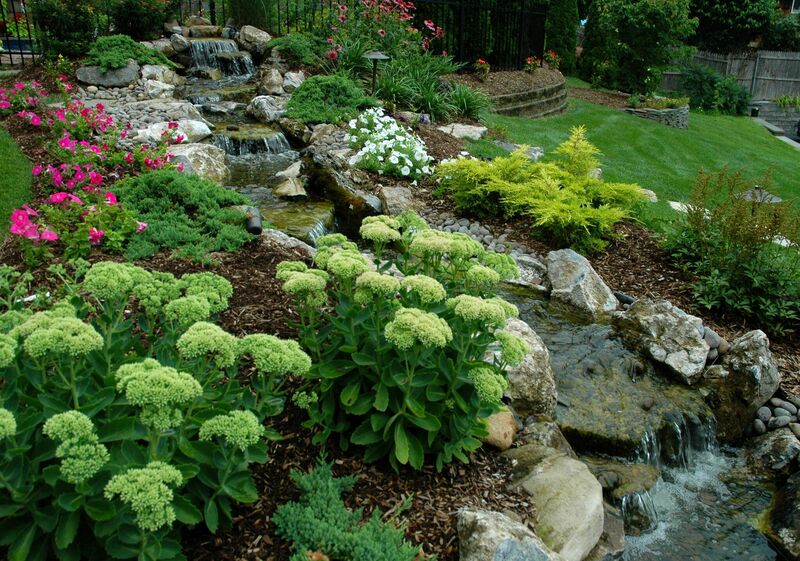 In addition, tall grasses, deep green ground cover, along with the peaceful sounds of moving water, totally captivate the senses. 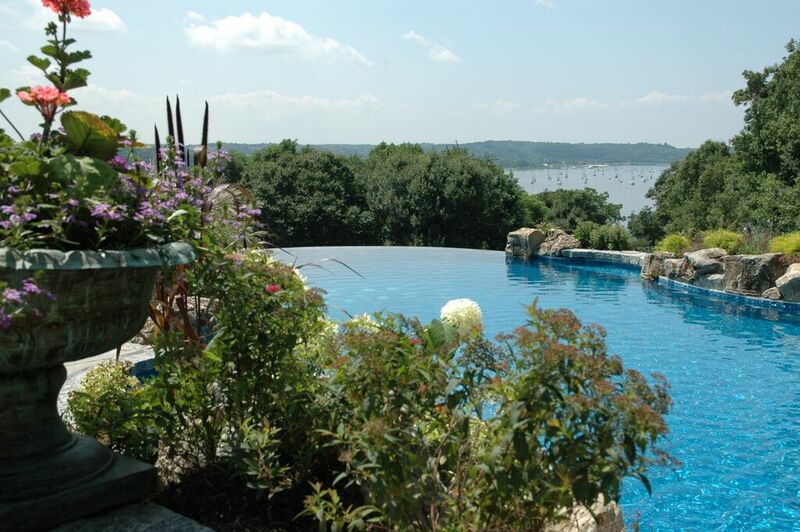 All this can be viewed from the pool area, back patio, as well as the house. 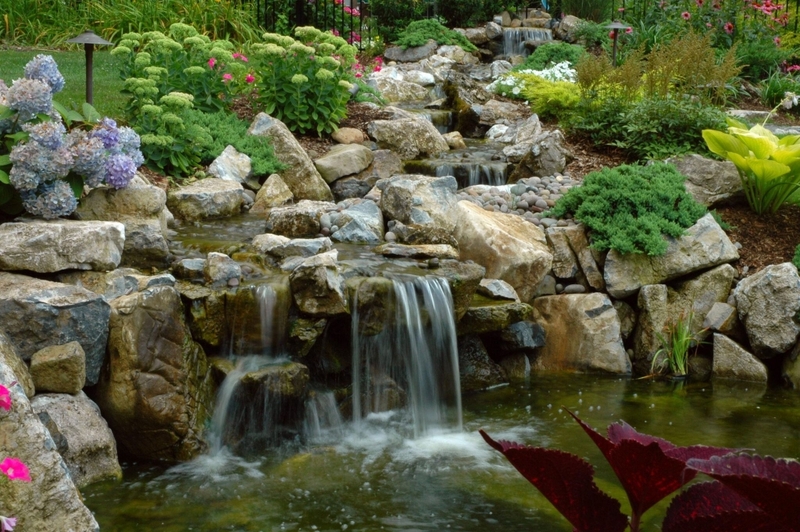 It takes expertise and experience to position rocks in such a way as to coax water into waterfalls just like it happens in nature. Members of Deck and Patio’s team enjoy the woods and hillsides of upstate New York — frequently stopping and studying how water flows over rock, how plants crop up alongside of such water trails, etc. Our design plan called for an extended patio with bluestone stepping stones leading to the stream, natural stones to walk across it, and more bluestone on the other side up to the pool area. 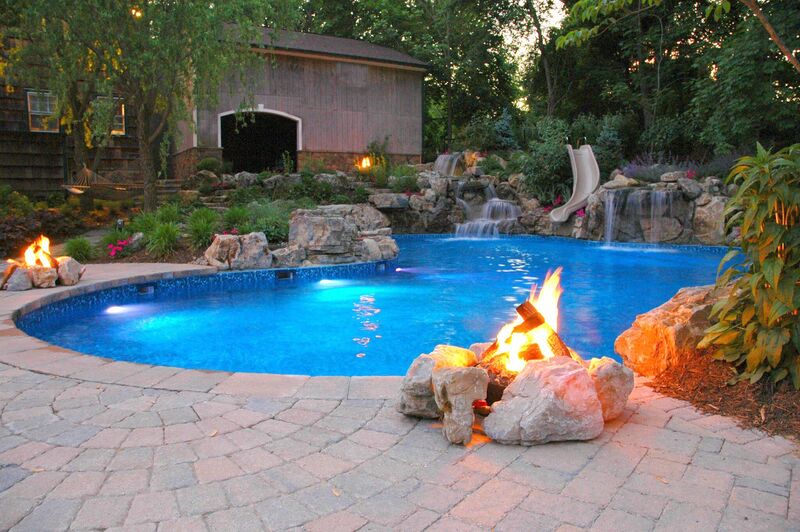 The owner of True Blue Swimming Pools, Michael Truehart, was contracted to do the pool for this project. 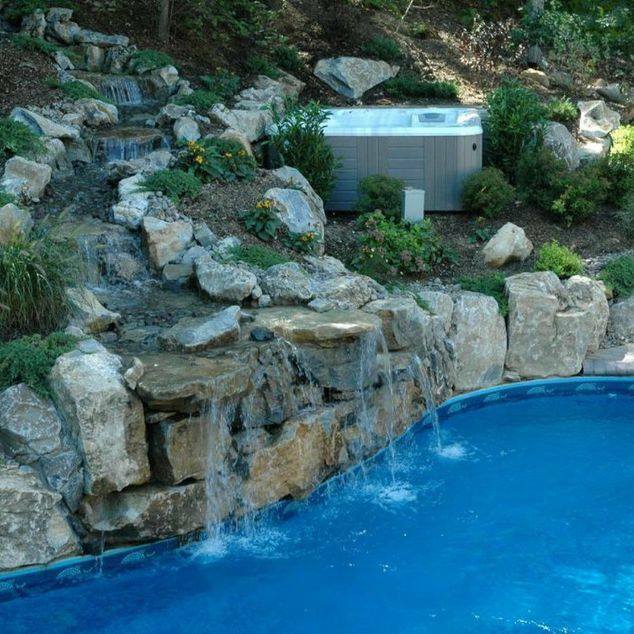 Much of the small backyard was sloping terrain, and the clients expected, as part of a new “natural-looking oasis that wows,’ that True Blue would build the pool on their only available flat piece of land. 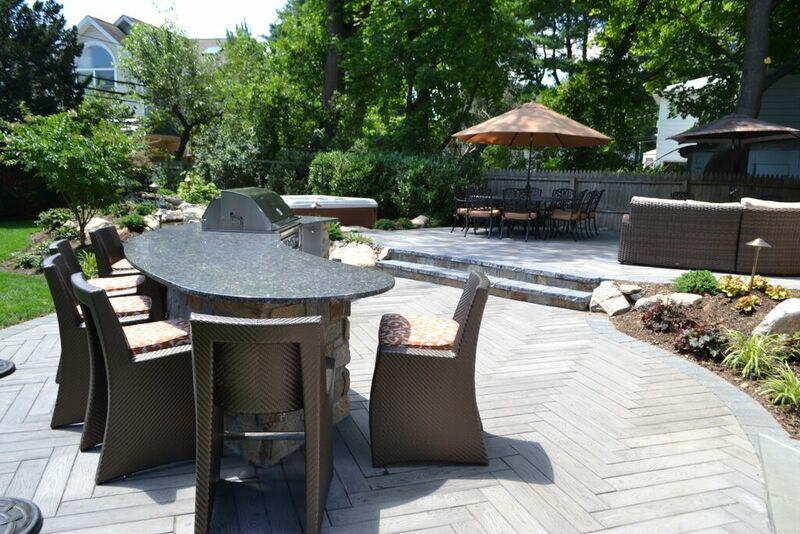 This project would require a lot of creative landscaping, and Truehart recommended Deck and Patio be brought in help with the project. 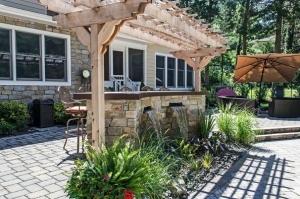 Bill adds that when he works within tight spaces, he makes sure the chaise lounge, dining and patio areas are all large enough for furniture, and have room enough to walk around. 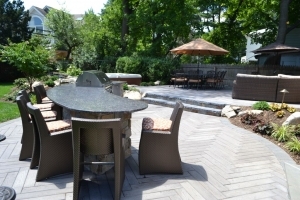 He also tries not to over-build or paver the whole space. However, it wasn’t just elevation changes that presented problems. 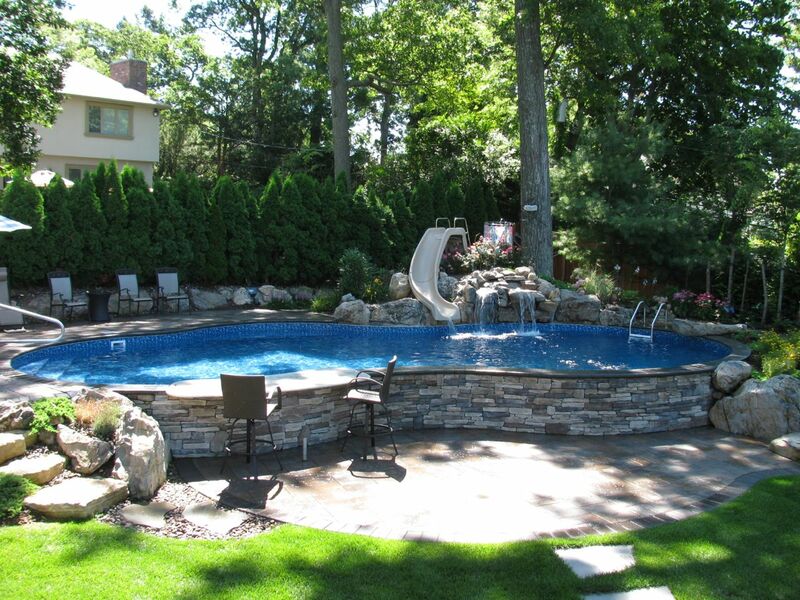 The finished vinyl-lined pool has a concrete wall; extra rebar was added to the exposed pool wall for strength, and the concrete footing was sunk well below the frost line to prevent heaving and shifting. 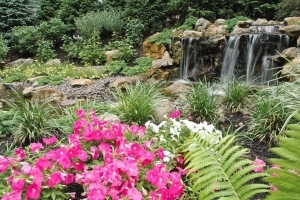 In addition to the waterfall area, throughout the retreat, smaller groups of boulders fitted with plantings act as natural and attractive retaining areas. 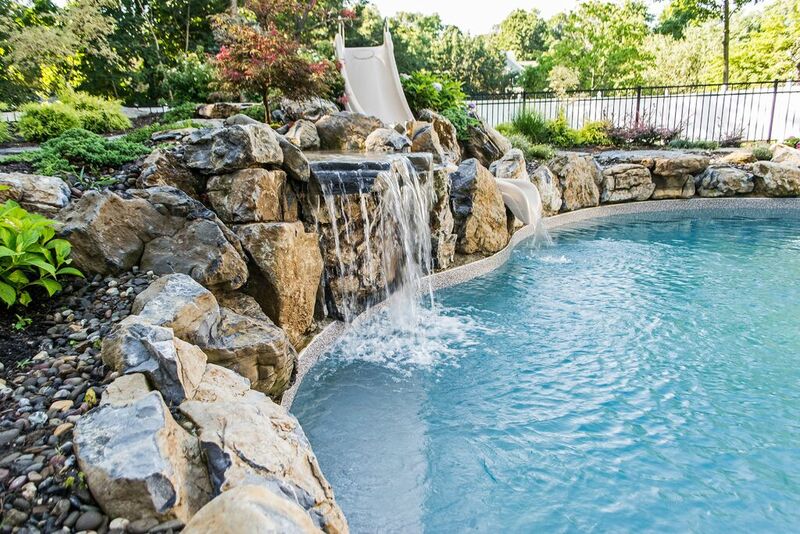 This project’s pool and pool-side amenities include a Wild Ride slide, granite swim-up bar with 3 vinyl-covered in-pool stools, diving rock, Tiki (Hula) patio umbrellas, outdoor shower, and lush plantings. Along with designing a freeform shape, True Blue Swimming Pools chose a Loop-Loc “Sea Blue” vinyl liner to give the pool an enticing South Seas’ lagoon appeal. 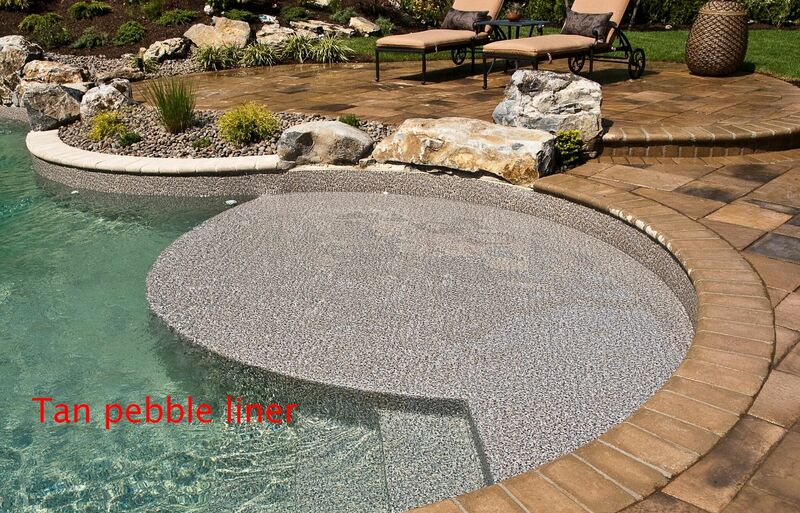 Fullnose coping also offers a harmonizing curved form. 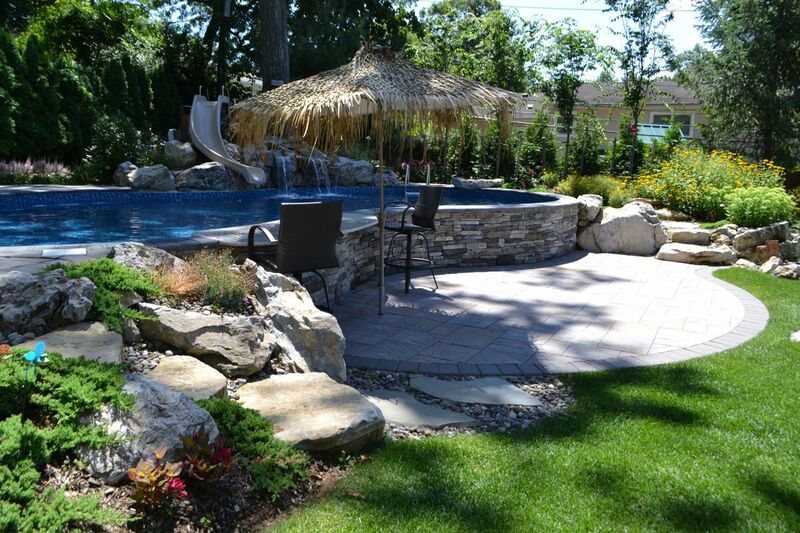 “One way we addressed the problems in using sloping terrain was designing the pool on one side with an exposed wall, which Deck and Patio veneered in Cambridge ledgestone,” says Michael Truehart of True Blue Pools. 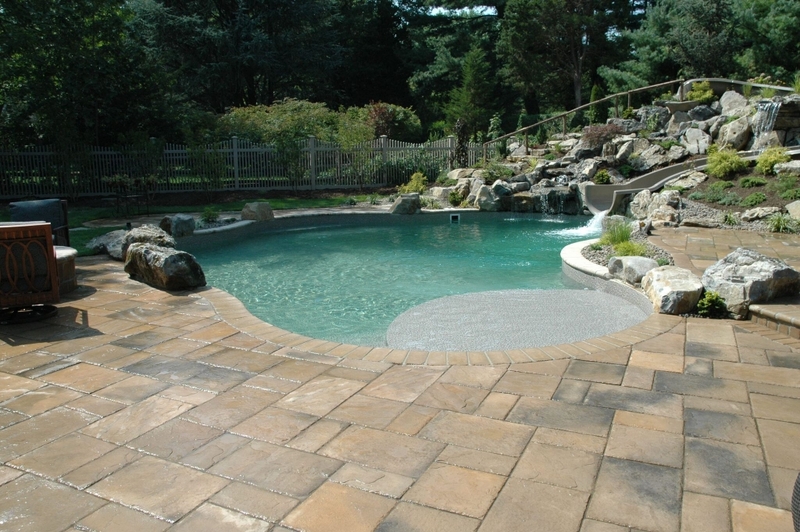 The pool’s vertical Cambridge ledgestone veneer adds drama to the lower patio area. 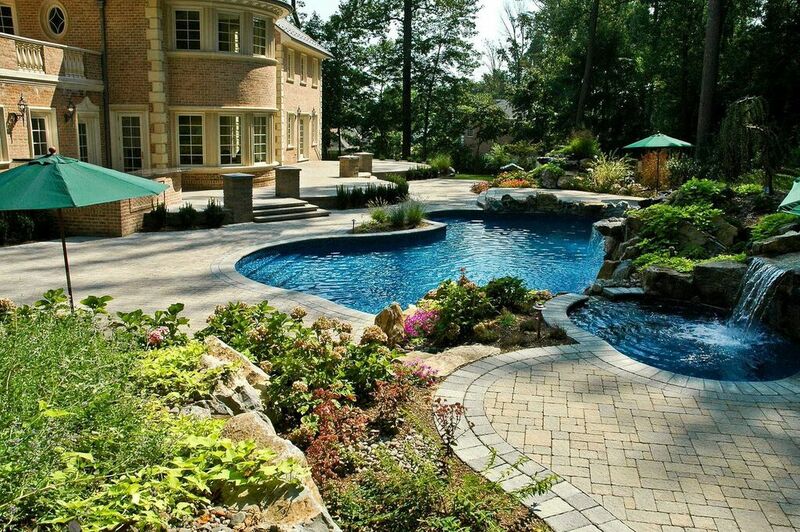 Natural boulder steps (left) lead up to the pool surround’s main lounging area. Restful waterfalls running over moss rock (on the Wild Ride slide part of the pool) are not just beautiful to look at, they do double-duty as a retaining wall. 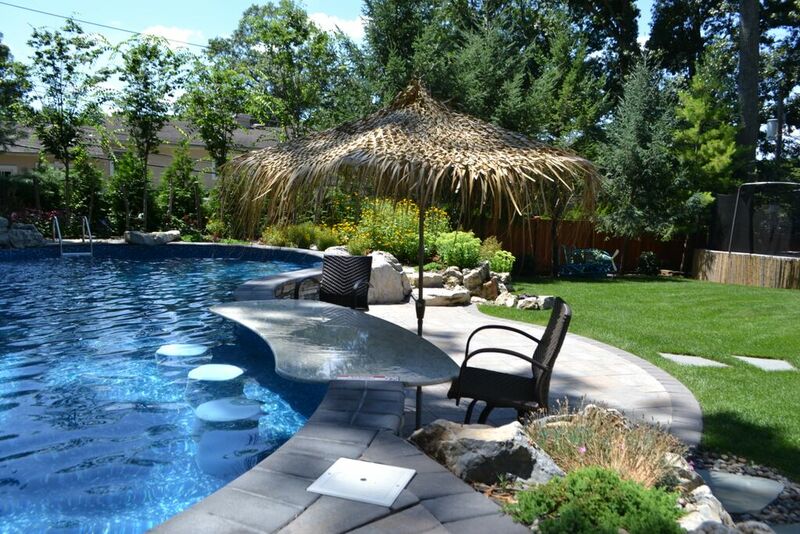 An impressive granite swim-up bar — with 3 vinyl-covered in-pool stools shaded by Tiki (Hula) patio umbrella — contribute to the “wow factor” the clients were looking for.